An old Norse chapel occupied the site in Norman times, which was enlarged to its present length in around 1300. The building was widened in1500 by the addition of the two side aisles, with their massive pillars and round arcades, which are found nowhere else in England. The church was basically as it is seen today from the beginning of the sixteenth century. Edwin Sandys, Archbishop of York founded Hawkshead Grammar School in 1585 and in the same year, he built a private chapel at the church to the memory of his parents, William and Margaret Sandys, William was King Henry VIII's Receiver in Furness. The chapel is still used by the Sandys' family. The recumbent effigy shows his father in full armour, a lion at his feet, and his mother in a long gown. At around the same time, the roof of the nave was raised and clerestory windows were installed to provide extra light. Edwin Sandys was born was born in 1519 at Esthwaite Hall, which lies around a mile to the south of Hawkshead. He spent time in prison, early in the reign of Mary I, for his support of Lady Jane Grey. The framed biblical texts which decorate the walls were painted in 1680 by James Addison of Hornby, near Lancaster. They are of a type of decoration which was widespread in the seventeenth century. 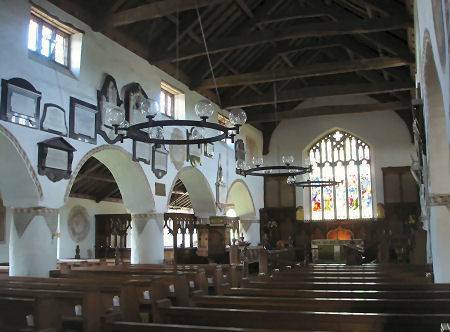 Grasmere and Windermere churches once had similar paintings which were whitewashed over. 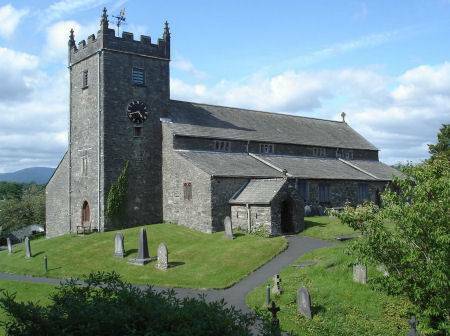 The wall paintings at Hawkshead were whitewashed over in 1794 and were rediscovered in 1875 when the church was restored. One of the wall memorials is of particular interest due its connection with William Wordsworth. 'The Reverand Thomas Bowman, MA, Headmaster of the free Grammar School' moved to Hawkshead in 1785 and taught Wordsworth during his last years at Hawkshead Grammar School. Wordsworth came to the school at the age of eight when his mother died in 1778 and, after his father's death five years later, he lived in the village at Dame Anne Tyson's house. An old chest constructed from a massive oak beam stands in the St. James' Chapel, it was made in 1603 to store parish registers. A medieval priest's door was rediscovered in the chapel in 1965, this has been made into a plain glass window, providing views over Claife Heights. In the churchyard stands a sundial carrying a plate dated 1693 and a war memorial, erected in 1919, based on the design of the ancient Gosforth cross, the memorial was designed by W.G. Collingwood. The churchyard is an important sanctuary for wild plants, a 2008 survey by Cumbria Wildlife Trust identified nearly 100 species. There are excellent views from the churchyard encompassing Esthwaite Water, Claife Heights, Helvellyn and the Langdale Pikes.